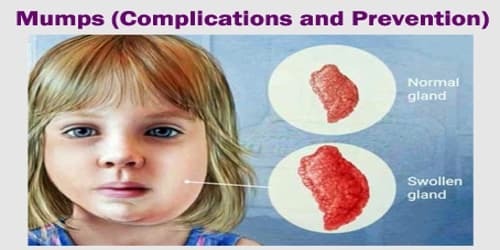 Definition: Mumps is a viral infection that primarily affects saliva-producing (salivary) glands that are located near our ears and it is caused by the mumps virus. The most obvious symptom is swelling of the salivary glands, giving the patient a “hamster-like” face. Initial signs and symptoms often include fever, muscle pain, headache, poor appetite, and feeling tired. The affected salivary glands are called the parotid glands; sometimes, the mumps virus can also cause inflammation of the testis, ovary, pancreas, or meninges (membranes that surround the brain and spinal cord). Once someone has had mumps, they usually become immune to future infections. Symptoms typically occur 16 to 18 days after exposure and resolve after seven to ten days. Symptoms in adults are often more severe than in children. About a third of people have mild or no symptoms. Mumps is more common in the developing world where vaccination is less common. Outbreaks, however, may still occur in a vaccinated population. Before the introduction of a vaccine, mumps was a common childhood disease worldwide. Complications of Mumps: Complications from mumps are rare, but can be serious if left untreated. Mumps mostly affects the parotid glands. However, it can also cause inflammation in other areas of the body, including the brain and reproductive organs. Testicles. This condition, known as orchitis, causes one or both testicles to swell in males who’ve reached puberty. Orchitis is painful, but it rarely leads to the inability to father a child (sterility). Pancreatitis. The signs and symptoms of this condition, known as pancreatitis, include pain in the upper abdomen, nausea, and vomiting. Heart problems – Rarely, mumps has been associated with abnormal heartbeat and diseases of the heart muscle. As rare as some of these complications are, it is important to seek medical advice or help if an individual suspect they or their child may be developing them. 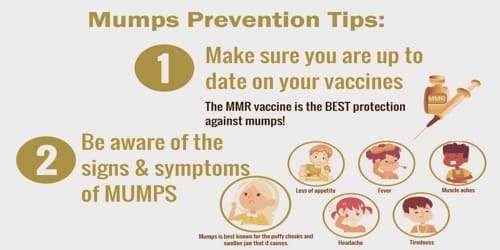 Prevention of Mumps: The best way to prevent mumps is to be vaccinated against the disease. Most people have immunity to mumps once they’re fully vaccinated. 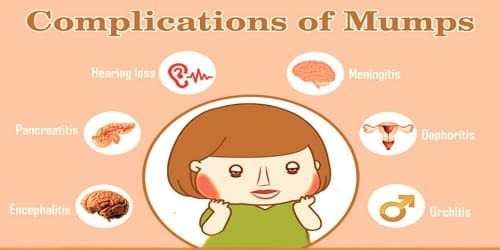 The WHO (World Health Organization) recommends the use of mumps vaccines in all countries with well-functioning childhood vaccination programmes. Some anti-vaccine activists protest against the administration of a vaccine against mumps, claiming that the attenuated vaccine strain is harmful, and/or that the wild disease is beneficial.